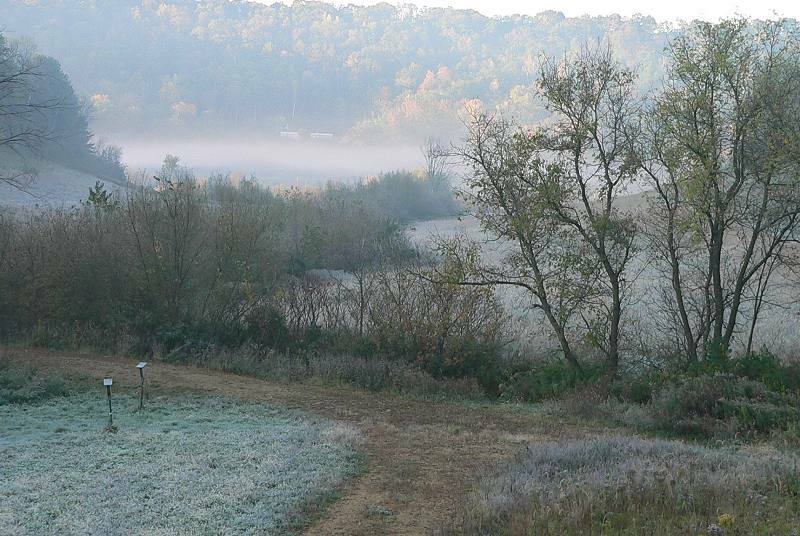 We had two frosts this week – not hard ones, but enough to turn the fields white. The temperature got into the high 20s. 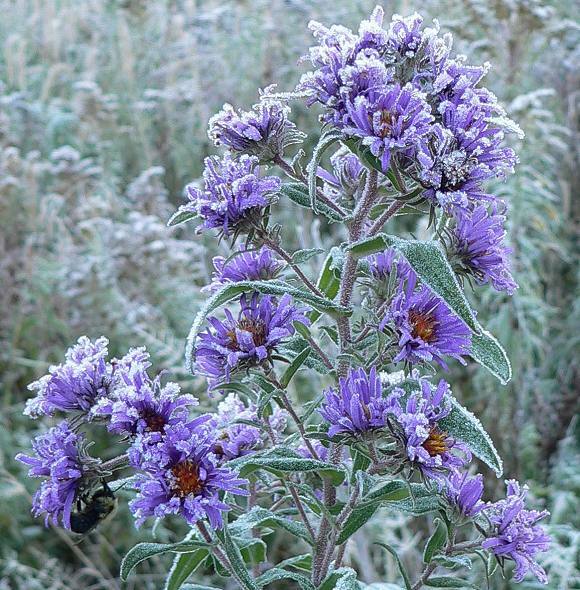 The New England Asters are still blooming – looking even brighter purple because everything around them has turned brown – or white. Here’s one in the morning covered with frost crystals. 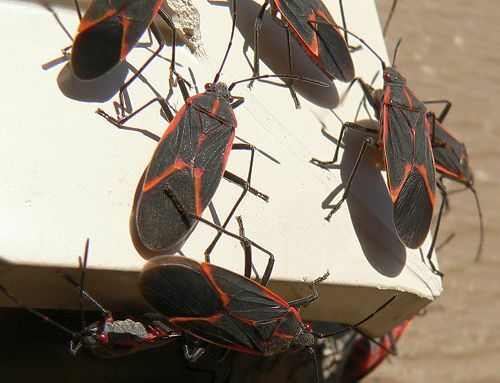 This year we’ve had an explosion of Box Elder Bugs (Leptocoris trivittatus). Usually we have Asian Lady beetles at about this time, but we haven’t seen very many of them so far, and their role has been taken over by the Boxelder Bugs. The bugs crawl over all the sunny sides of the house and the garage – apparently looking for a way into a sheltered place to spend the winter. I watched a Sharp-shinned Hawk catch a small bird – no photo – they flew much too fast. First the hawk flew into the tree next to the birdfeeders – scaring all the birds away. Then it sat very quietly for about 5 minutes until one unlucky bird came back to see if it was safe. The hawk dove after the little bird, caught up with it, flew just behind it for a second or so, and then caught it so fast that I couldn’t see how it happened. Then it flew into the bushes with its kill. And immediately all the other feeder birds came back. I sprayed the biggest of the wetland areas that we mowed to get rid of Reed Canary Grass. It’s hard to find a good time to spray – it’s either too windy or too frosty or too rainy. But I managed to get most of it done. Now I’ll spray the edge next to the creek with Rodeo – which is rated for places near water. I saw two migrating birds that are new for my inventory: a Golden-crowned Kinglet, and a Solitary Vireo. We’re still seeing lots of migrating birds – the woods are full of Robins and warblers and the bushes are full of White-throated Sparrows. All my cecropia moths finished making their cocoons about a month ago. The last two caterpillars completely lost interest in making cocoons – they stopped eating and wandered around their cages for a week or so. I finally let them go in the garden, but I think they must have been sick. A few people I gave caterpillars to also lost some caterpillars – but only 3 that I know about. I’m hopeful that the rest will survive and hatch into healthy moths next June. 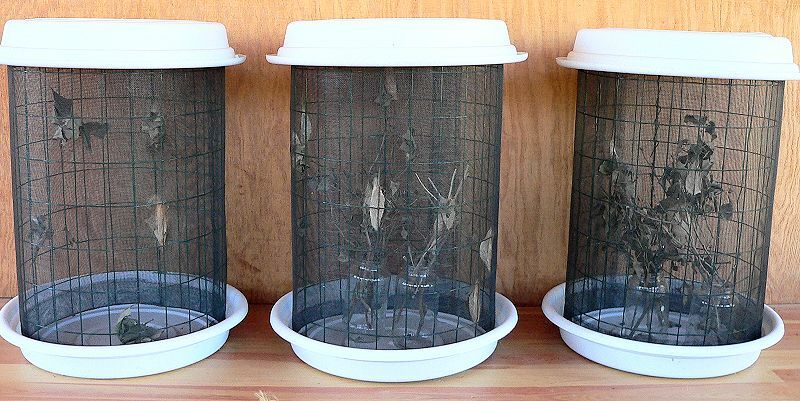 Here are my 3 cages with 21 cocoons. The bundle of leaves on the bottom of the cage on the left is the cocoon of a Polyphemus Moth. It should hatch next May.